Download "Selling SOA to the Enterprise"
Check out our class "SOA for Managers"
Alignment of IT with the goals and objectives of the business has always been one of the holy grails CIOs strive for. The principles of SOA, if applied correctly, can bring Business / IT Alignment closer to reality. We can help you formalize a clear vision on how IT provides value to the business. 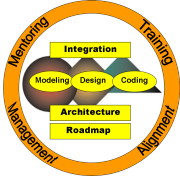 We focus on the alignment of SOA with business demands. We help you achieve consensus on how to employ SOA across a multitude of initiatives. We engage all stakeholders in a strategy to maximize efficiency and synergy. We facilitate optimization of organizational structures and technology strategies.